The all-new 2019 Subaru Forester may be missing a 6-speed manual gearbox, and the 2.0-liter turbo XT models, but it should push up the fun-to-drive meter. The new fifth-generation Forester will be more fun to drive than the outgoing model because it will ride on the new Subaru Global Platform (SGP) like Crosstrek and Impreza before it. It also gets WRX/STI technology. The 2019 Forester gets an updated suspension, improved body stiffness which will translate to better stability than the outgoing model, and a lower center of gravity for less body lean in the corners. It will also get more agile because of something called ATV. Active Torque Vectoring (ATV), first introduced on the WRX and WRX STI performance cars, is now standard on all 2019 Forester trims. Consumers will get greater control of the small SUV and improved hazard-avoidance capabilities. The system helps reduce understeer and keeps the vehicle on the driver’s intended cornering path. What difference will driving enthusiasts feel? This technology developed in the WRX STI makes handling more precise and enhances the vehicle’s agility, especially in the corners. This is accomplished by using the braking system to help turn the vehicle. ATV allows the driver to push the performance envelope to the limits and gives the driver a greater sense of control in spirited driving. Subaru developed the system in motorsports and transfers the technology to their production vehicles like the Forester. Without it, the forward motion wants to keep the vehicle moving in a straight path. ATV effectively brakes the inside wheels under cornering and apportions greater torque to the outside of the car, reducing understeer and oversteer to allow a more predictable and controlled course through curves. It will keep Forester carving the tight corner. The new SUV comes in a new trim called Forester Sport that should also dial up the fun-to-drive meter. Sport comes with an appearance package, but it also employs a version of Subaru Intelligent Drive (SI-DRIVE) that comes on the sport-tuned WRX sports sedan. Drivers will be able to choose from two selectable modes; Intelligent and Sport Sharp. The Lineartronic CVT automatic transmission also features a seven-speed manual mode with steering wheel paddle-shifters. Sport Sharp mode will get the maximum potential from the newly-redesigned 2.5-liter boxer engine. If it’s anything like the WRX, it should deliver smooth shifts through seven electronically controlled steps. The driver can also use the steering wheel paddle shifters and manually shift the CVT simulating actual gears for a more engaging driving experience. 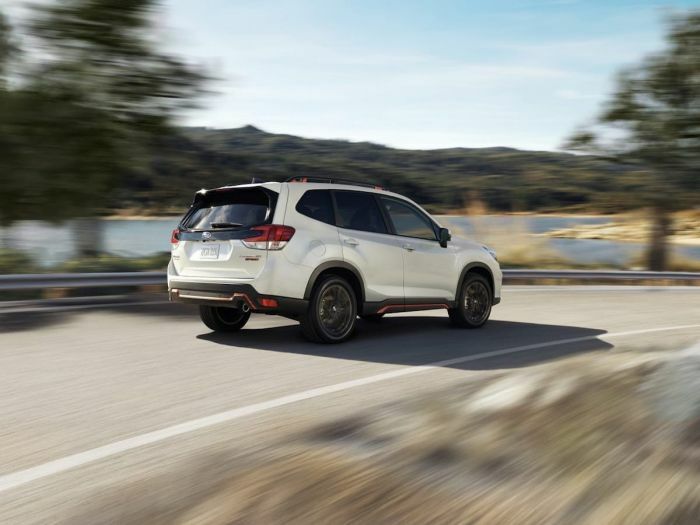 The new 2019 Subaru Forester will be available in U.S. showrooms later this year, and now comes with the new Subaru Global Platform for improved driving dynamics, and a new Sport trim with SI-DRIVE. Now all performance fans need is a Forester STI. Hmmm, smoke and mirrors without the turbo engine. The simulated gears won't help much but hey I applaud some of the other improvements.